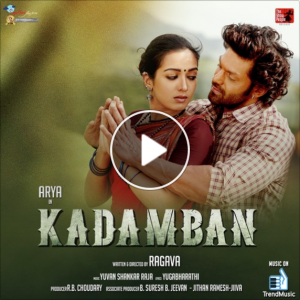 Kadamban (Music review), Tamil – Yuvan Shankar Raja by Milliblog! Despite Mukesh’s enthusiastic signing and the ebullient percussion, Uchimalai is perfunctory. But in Ilaratham soodera, Yuvan shows how to do even the perfunctory in a convincing manner! Otha paarvayil starts with a haunting prelude but goes downhill as soon as Yuvan starts to indulge in something akin to singing. Even Srimathumitha seems out of sorts. This tune deserved better. Velmurugan, Jaya Moorthy and Anitha make up for that in Saama kodaangi, a phenomenally energetic folk number with an addictive lilt. Aagaatha kaalam‘s searing pathos gets a huge fillip from Ananthu’s expressive singing and Yugabharathi’s evocative lines. Customary work by Yuvan.